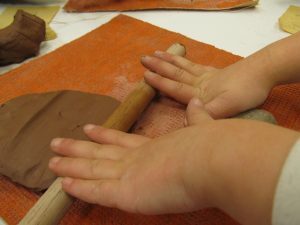 Children have been using tools with clay. 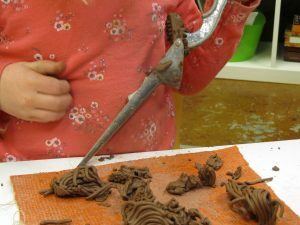 Tools such as a garlic press for extruding and using slip to connect pieces to sculptures. 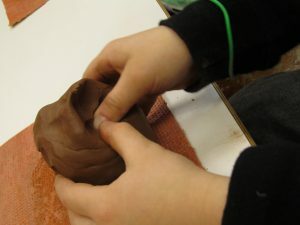 They have also been encourage to use their hands and fingers for pinching as tools to creating pinch pots. We have begun our second 12 week series with our visiting artist, Deb DeMarco. 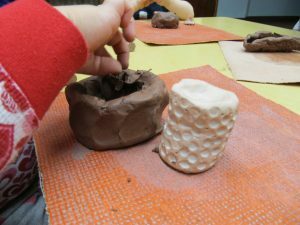 Below are some pictures of our first two weeks together. 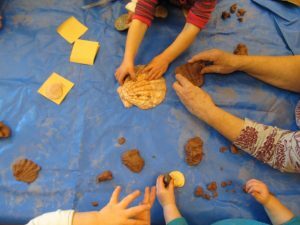 In our time together, children have been exploring clay, creating texture on their pieces, using tools to provide detail, and using natural materials for draping their clay and providing shape to their work to be preserved and fired in the kiln.